Modeled after a traditional analog SPL meter, we have faithfully reproduced all the characteristics and qualities found in those meters, including the ballistics, ranges, filters, and decay rates. Under the hood we have advanced DSP-based algorithms that meet or exceed ANSI / IEC Type 1 standards. And starting with iOS 6, we can disable the mic filters and limiters, to get the real world performance of a hand-held SPL meter. And now, upgrade SPL Meter with iTestMic, our pro-grade test & measurement mic, made specifically for iOS devices. Using iTestMic with SPL Meter, you get a calibrated, accurate SPL Meter, that meets industry standards for Type 2 performance. See our website for more information. But don't compare us to a Radio Shack meter, ours is much more accurate! We have also included a digital LCD display, as shown in the image, to make this the best SPL meter available for iPhone or iPad. And this is something that the old analog meters never had! SPL Meter is a universal app buy once, and use on all of your iOS devices. SPL Meter is built by the same team that created the other great professional audio and acoustics apps on the store, Studio Six Digital. Built on the engine of our more expensive "SPL" app, SPL Meter's filters and decay rates meet or exceed ANSI type 1. This app is not a toy or a game. 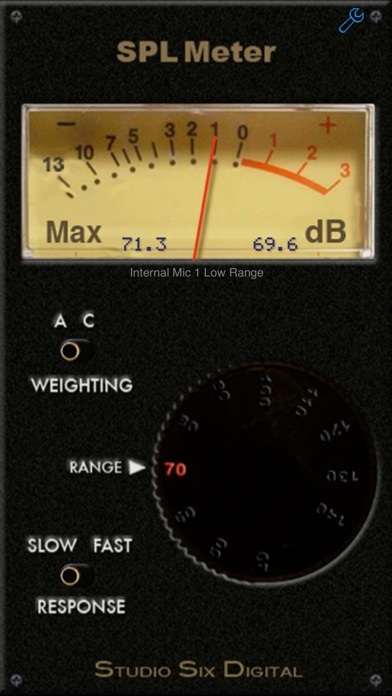 SPL Meter is the one audio app that everyone who works in audio must have on their phone! Not only have we made the best one, but we've priced it so you can't afford not to get it. FILTERS A and C weighting filters are provided. DECAY Choose ANSI Fast or Slow. RANGES 40dB to 120dB in 9 ranges. CALIBRATION Comes pre-calibrated for the typical iPhone or iPad built-in and headset mic, but you can adjust the calibration if you have a professional, calibrated meter to compare it to. Accesses our cloud-based iOS device calibration database, which we updates as new devices are released. INTERNAL / EXTERNAL MIC Select Internal to activate the included compensation filter, which is designed to flatten the frequency response of the built-in or headset mic. External will work with our iPhone Measurement Mic, to be released later this summer. See our website for more details. SPL Meter is bargain-priced to make it easy for anyone to check out one of our professional, accurate apps. Studio Six Digital is dedicated to making the iPhone and Touch a professional audio and acoustics test device. Check out our full line of professional-grade audio and acoustics apps: SPL, the professional digital iPhone sound level meter, SPL Graph, for recording SPL over time, RTA, a 1/3 octave real-time analyzer, FFT, for detailed acoustic analysis, ETC, the energy-time curve function, RT60, for automated octave-band decay time measurement, Speaker Pop, to test speaker polarity, and Generator, the iPhone signal generator. Also, if you are looking for more great acoustical and audio test apps, have a look at AudioTools, our premier app for audio professionals.